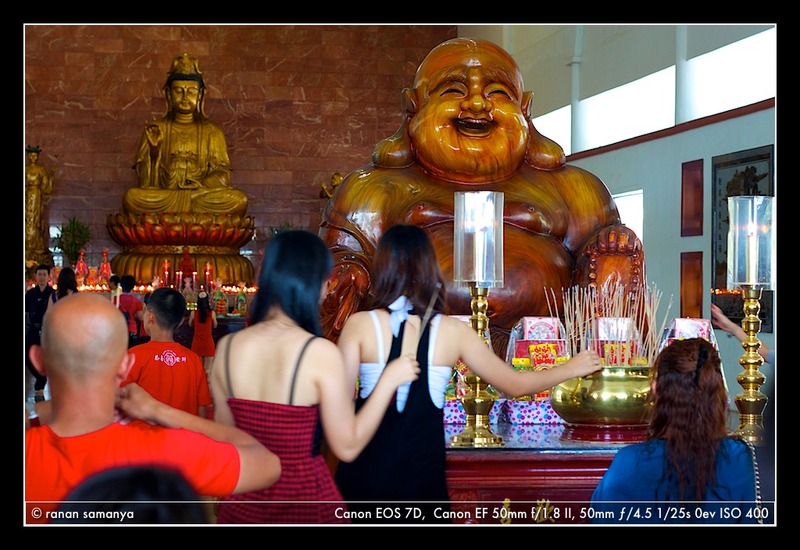 Every year on Chinese New Year, thousands flock in the largest Buddhist temple in Batam, Maha Vihara Duta Maitreya, to thank Buddha for the life, to ask for (more) fortune, and… to have free meals! Yes, every year for the past five years, the Vihara has been providing free vegetarian food from early morning until late evening for everybody, regardless of race, religion, or fortune. This year, it was said that 50 chefs and 200 volunteers prepared the meals in its four kitchens, which included 2 tons of rice, 300kg noodles, 20 sacks of potatoes, and 1 ton of green vegetables. All to feed approximately 25 thousand visitors. The scene of the volunteers chopping vegetables reminded me of my enriching time with my Cafe Momento friends in Yogyakarta during a relief effort for Merapi disaster back in 2010. Eight long tables full of bain-marie with food continuously poured in kept the visitors happy, and with three thousand provided plastic chairs nobody had a reason to complain. What impressed me was that in such a hectic event, the Vihara still managed to think green: they segregated the kitchen waste and utensils from visitors, including the empty mineral water cups. In addition I failed to notice a single fly in the huge complex including the kitchen area. I think the Dragon scared them away. A peek to the start of the Year of the Water Dragon here.